A mixture of musical genres, including opera, jazz, bell-ringing and beatboxing, have been chosen to feature in the 2012 Cultural Olympiad. The 20 works will each last 12 minutes and "offer a snapshot of the quality and diversity of new music in the UK", according to organisers. BBC Radio 3 boss Roger Wright chaired the panel that selected the pieces for the "New Music 20x12" project. He said they were impressed by the "quality and range" of music submitted. 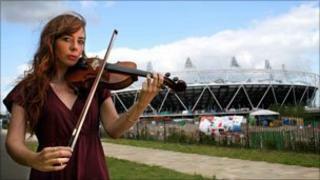 The pieces will be broadcast on Radio 3 and may also feature at official events linked to the 2012 London Olympics. Organisers said the music reflected "the energy, hope and excitement that will emanate from across the Cultural Olympiad and the Games themselves." One of the pieces - Wild Bells to a Wild Sky - will be created by the Central Council of Church Bell Ringers. Composer Howard Skempton said he wanted to use bells because they "proclaim moments of public gathering, celebration and of important news". Composer Anna Meredith, meanwhile, is teaming up with the National Youth Orchestra to create HandsFree, a piece using the percussive skill of beatboxing and clapping. Other pieces include one put together by inmates at Lowdham Grange prison in Nottinghamsire and another exploring the sounds and rhythms of table tennis. New Music 20x12 will be delivered by the PRS for Music Foundation in partnership with the BBC, the organisers of the London Olympic and Paralympic Games and Sound and Music. The Cultural Olympiad started in 2008 and will culminate in a London festival running from 21 June to 9 September 2012. Actress Cate Blanchett, Blur's Damon Albarn and artist David Hockney are among the celebrities whose involvement was announced earlier this week. Poetry lovers are also being asked to get involved by submitting verses that they think will help boost participating athletes in the 2012 games. A panel of judges, including poet laureate Carol Ann Duffy and author Sebastian Faulks, will determine the chosen lines, which will eventually be engraved on a wall in the Athletes' Village.